Here in Oregon the smoke is thick as winter fog. Like fog, it makes the world seem silent and a bit ominous. The sun shines through and spreads a strange orange glow on the landscape, and the it looks like a glowing red ball as it sets. Our eyes burn, and our sinuses ache, and we cough, and the air seems almost poisonous. The smoke blew in from further east, we are told. We're also told that some 90 fires are burning all over the Northwest. The stories and pictures are just terrifying. It all has an apocalyptic feel, and we are praying and hoping for rain. Three firefighters have died, and it hits me hard, because Steven is learning to be a firefighter and EMT. "No, Mom, they're not going to send me to fight wildfires," he says. "I'm not certified for that." But they're taking people from local fire departments, and prisoners, and the National Guard. So he and his classmates might be next. One of Steven's first assignments, once he was qualified to go on calls, was to rescue a cat out of a tree. Yes, just that cliche, but it totally warmed my heart to hear him tell, grinning, how he climbed the ladder 20 feet into the tree and rescued the cat and brought it down. He is a Rescuer at heart, and it's right that rescuing should be his life work. But firefighting is more than rescuing cats, and one of these times he will be the guy in the yellow suit, heading straight for the flames with 50 pounds of hose on his shoulder. May God surround him with protecting angels when that day comes, and may He send an angel or two to keep me calm as well. This has been a busy busy summer. Dad was here for most of it. 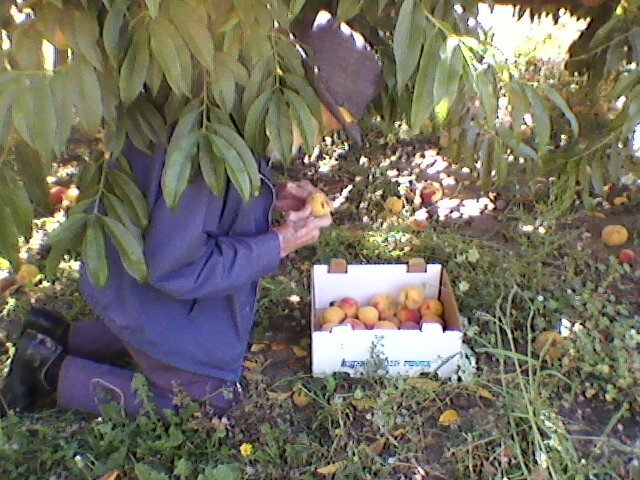 We went to Detering Orchards and Dad got to pick up windfalls. We looked up the spot where Grandma jumped off the train. Dad liked to watch the action over at "the plant," as he calls it. Here he watches Keith push Leonard Baker's seed into a pile. My brother Marcus, in the middle, brought Dad to Oregon, along with his wife Anna. Phil, on the right, came for a visit. So we posed for a sibling picture. "Put your arms around each other for goodness sake!" said the photographer. So we did. Two mama cats had lots of kittens. One cat was a good mom, loving, attentive, calm, practical. The other cat was really an odd mama, obsessive and oblivious by turns. Jenny put the cats' water in an old pie tin instead of a sour cream tub so the kitties could drink more easily. Well. The strange mama has this bizarre habit of leaping straight up and about three feet north whenever we open the door, no matter if she's asleep, eating, whatever. 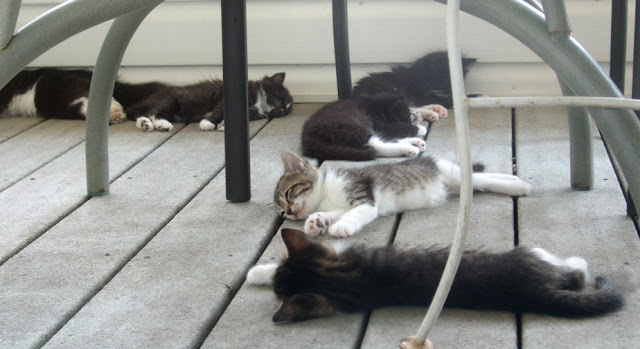 One day she was lying on the porch, nursing her babies. I opened the door and she levitated off the floor, scattering kitties in all directions. One of them landed right in the pie tin of water. "That's what happens when you have kids too young." Oh Steven, we love you. 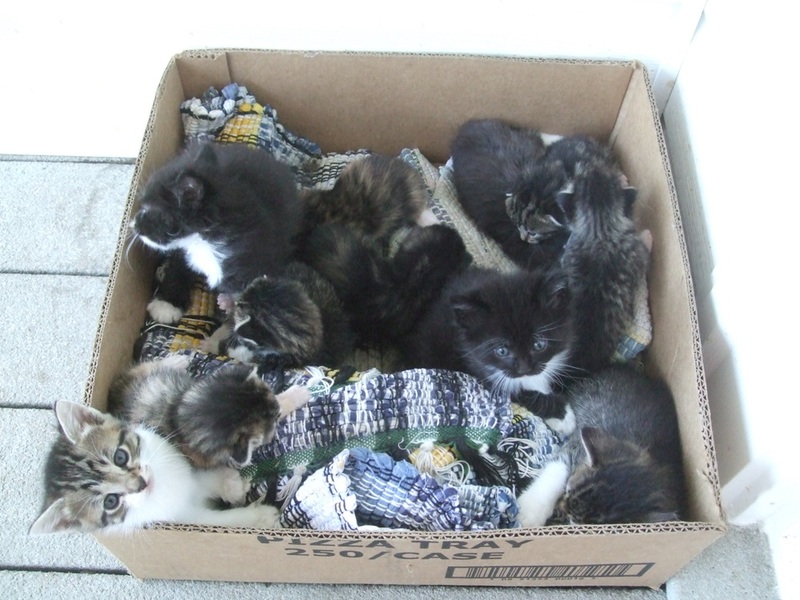 Two batches of kittens in one box. It has been a hot summer. The cats start melting at about 85 degrees. 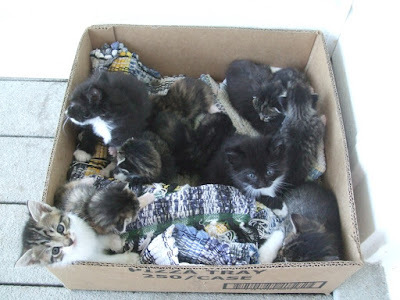 And yes, for all the Animal People who are right now reaching for their phones to call me because I must not know about Spaying, we are giving kittens away to Good Homes and will take Steps to Prevent such a Population Explosion in the future. I just wish the cats would ask Paul before they start dating, like the daughters do. It would at least give us fair warning. Yesterday we went to a wedding and like I do at weddings, I watched people and whispered observations to the daughter beside me. I love to watch people, and tell stories about them, and figure out how they're connected to everyone else I know. I also like to imitate them, and laugh about their quirks. Because some people, oh my, they just have all these odd delicious quirks and they always do these same bizarre things that they've done for the last 40 years, and it is so much fun to discuss this. And if you are talking with someone who is equally fascinated by people, it is just so much more fun than observing it yourself and making notes about it in your little notebook. So we were sitting there watching people file out, bench by bench, hugging and hand-shaking the bride and groom, and that One Guy with a reputation for Being Like That filed out, and I whispered something about it to Jenny, with a snicker. And then I realized that he might have a family member sitting close by who could have heard what I said, and suddenly I felt Horrible and Mocking and Unkind. Since then I've been wondering about these things, and what are the proper boundaries, and how do you enjoy observing the endless variety of personal quirks without descending into belittling and nastiness? On the one hand, I think you should be allowed to say some things about people, in the privacy of your home, that you would not say to their face. I also think that if people don't want to be spoken of in That Way, they should refrain from doing Those Things. And I don't know if I could survive as a pastor's wife if Paul and I couldn't have honest conversations about people. But I also felt like the moment at the wedding was a Holy Spirit nudge that my heart was feeling like I was way superior to That One Guy and my amusement was far too condescending. Maybe that's the key thing, and maybe it's ok to enjoy other's oddities and strangenesses if I let people get just as much amusement out of mine, recognizing that I have plenty to choose from. My last post was about a busy day, which was part of a terribly busy week. Then, suddenly, Pauline Scheffel's funeral was over, and so was VBS, and Matt was back in Washington, D.C. So Paul and I went to the coast for a few days and stayed in a nice ocean-front hotel, thanks to the generous school board and their end-of-year gift. I walked on the beach a lot and it was rest for my soul. 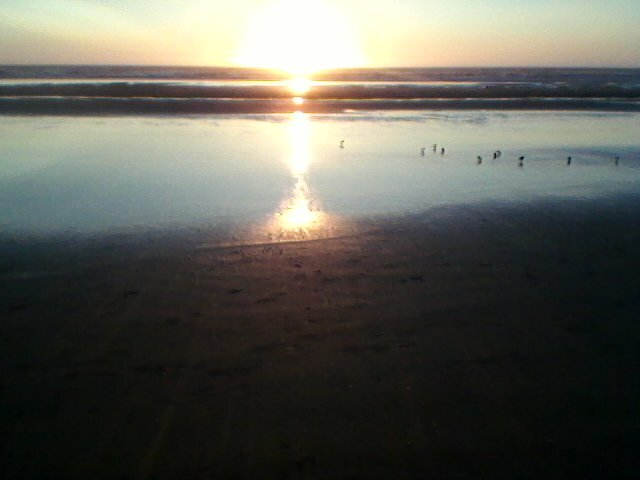 I watched the sun set and I watched the sanderlings, who are the happiest birds ever, run along the shore with their zippy little legs. They like to peck the microscopic creatures the wave leaves behind, so they run along in a group, always at the top edge that the wave reaches on the sand, and they peck and run and have good times with each other. In fact, they are a lot like Pauline who passed away last week--small in size but it doesn't bother them in the least, moving rapidly and getting a lot done without being nervous or frantic, just very happy to keep busy doing what God made them to do. We also went out on a whale-watching expedition because there's a pod of some 200 whales that summer close to Newport, and Paul thought I really needed to go out on the ocean for the first time. He bought me some Dramamine the day before, since I get carsick and airsick, and surely I would get seasick as well. The Dramamine was a 24-hour variety, and it bragged that it was "less drowsy." Well. I took half a pill and spent the next 28 hours falling asleep pretty much every time I sat down. But first we got on the boat, which motored out of the bay, where the fishermen were unloading tuna, and then out past the jetties, a rough ride in itself, and then it hit the 5 and 6 foot swells, plowing up and plunging down like a bull at a rodeo. "Just watch the horizon!" said the cheerful lady at the microphone. I have a feeling she also wrote the "less-drowsy" label for the Dramamine and is also the person who tells pregnant women to drink ginger tea to take care of their morning sickness. I leaned back against Paul and closed my eyes. "We're having some ocean motion!" said the microphone lady cheerfully. She said "ocean motion" several times, like it was very clever. We did not see whales. 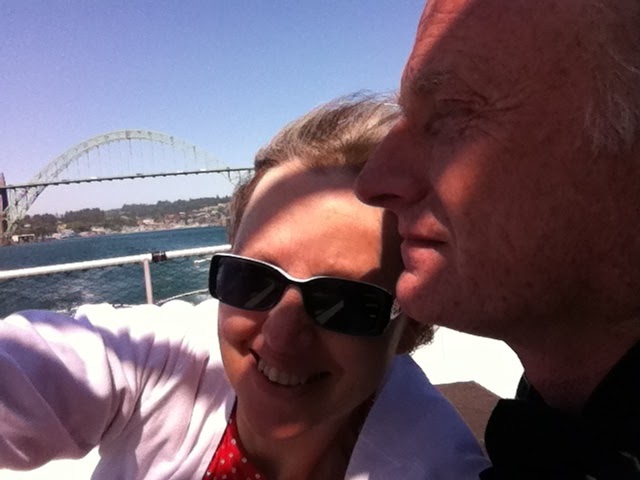 The ride back was with rather than against the wind so I could open my eyes and take in the demo on the stern, where Mrs. Cheerful had some kids drag plankton out of the ocean in a cool little net with a cup on the end. She was always recruiting Helpers, since the boat was full of children on a field trip with OMSI. I even got to be a Helper and hold the strainer while she poured the water through. So it was kind of a disappointing trip, all around, but I didn't throw up, and I can now say I've been on the ocean, and it is nice to have a husband who wants me to have new adventures. Here we are just past the bridge, and I am still smiling. No, I'm afraid it wasn't my cup runneth-ing over with J-O-Y but rather the one in my head overflowing with stuff. I often say I have a cup in my head that holds information about what I need to remember, who I need to call, what I need to take along, stuff like that. This cup has about a half-cup capacity. Anything that spills over gets forgotten. This week is Vacation Bible School, and Matt is coming for a visit, and a dear older lady from church passed away. This morning my phone rang. Should we warn the funeral-goers about the traffic from the Country Music Festival? I called someone who should know. They texted back: yes. So I put it on the prayer chain, a process that involves calling a number and then beeping through four or five options, and then recording the message, which involves about three takes because I always flounder near the end or someone walks into the room, hollering. Another person called. Could I set out the lunch for the family before the funeral tomorrow, if they buy the food? Yes I could. Another person called. Did I realize they and we were in charge of the VBS picnic on Saturday, since we're on the missions committee? No, I hadn't realized. Yes, I can pick up food for up to 200 people at Costco, since I'd rather do that than set up tables and chairs. I was trying to figure out how to pick up Matt at the Amtrak station at 3:30, go to Costco, and also get to the viewing by 6 pm. Meanwhile I was trying to cut out and sew a skort for Jenny's friend Brenna who is going to a Baptist college next week and needs below-knee feminine athletic attire and I had told her I'd make her something. Another person called. Could I put on the prayer chain that they desperately need cookies for VBS? Paul's mom called. Could she go to the viewing with us? I said I'm not sure, with picking up Matt and stuff. She decided to go with her daughter Lois. Then I drove over to Horse Creek Farms to replenish our supply of fresh vegetables. And washed another load of Dad's bedding, since Paul and I flew with him to Minnesota last week, and left him there, returning Friday evening, and now I'm washing his massive stack of blankets. I texted Jenny to pick up lunch meat from the deli at work. Ben came home from his class at OSU. We discussed possible weekend plans, such as hiking to Horse Rock, when Matt is here. Hey! Maybe he could go get Matt at the station! He said he would. Yippee! I got meatballs out of the freezer for supper and butter out of the fridge to make cookies. A guy named Derek Morgan called. He had a telemarketer accent and said he is Emily Smucker's boyfriend and went to college with her, and he is worried about her because she hasn't been in da class. I said, "Tristan, is this you?!" because it sounded like Cousin Darrell's son trying on a voice. "How's that? What did you say?" I hung up. He called back with more of the same. I laughed at him and hung up again. Emily was driving tractor. I texted her about these calls and she found it funny because the guys in college who fell in love with her were always named Derek, but this didn't seem to be one of them. Ben called. The Bolt bus was at the station but Matt wasn't there. I had gotten the date wrong. Matt is coming tomorrow. I texted the other kids so they'd know. Steven said he won't be able to get off to come home this weekend at all. He is a very dedicated firefighter/student but it made me sad he couldn't come. I frantically sewed the skort some more. And I decided not to go to the viewing after all since I'll see the family over lunch tomorrow. I set sprinklers and kept overloading the pump, so I had to go out to the pumphouse and re-set the pump, which puts pressure in the new pressure tank, which looks like a Minion [weird little movie character]. Paul said he can go to Costco for me! What a relief. So I made such a grocery list as you need for up to 200 people, such as 125 hamburger buns and 6 big bags of chips and 200 ice cream bars. And he went and bought Much Stuff, and delivered it right to church and put the frozen stuff in the freezer, God bless him. The clinic called and said I can pick up some samples of medication to tide me over until my order comes from Canada. I put rice in the cooker and then drove to Junction City and fetched the medicine. I made sweet-n-sour-meatballs for supper. The meatballs burned because I was busy listening to Emily who was wondering if a young man from CouchSurfer.com could stay with us for a few weeks while he works at Detering Orchards. We decided "no." I hung up laundry, and fed the cats, and texted Brenna about the skort, and washed dishes, and took the rings off the applesauce we canned yesterday. There was more, but I don't remember it. My day felt like Too Much, but it would have been So Much More if Ben and Paul hadn't gone to town for me. Some people thrive on things coming at them from all directions. Like Paul, for instance, who comes alive when his phone is always ringing and he has 15 decisions to make and is always going going going. I have never done well with this. I did better back when I still had my full mind, but now it is not fun. And yet, it keeps happening, no matter how much I say No, which makes me suspect that I have a deep lesson to learn here, like maybe I have made an idol out of time alone and rest, since they look so impossible and appealing just now. Yesterday was much the same as today, plus we were canning the first batch of applesauce. 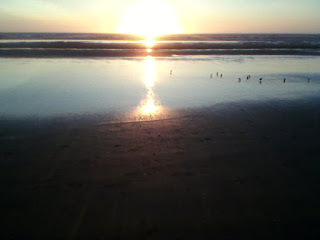 To save my sanity I decided not to attend the Oregon Christian Writers Summer Conference Awards Ceremony last evening. It was in Portland, and I was a finalist in the Published Article category. I haven't heard yet if I won or not. So I might be a real Award-Winning Author, but some Award-Winning Authors have to wash applesauce kettles. So this is why I haven't been writing much, or blogging, or working on new projects. Writers like Jan Karon, I am told, write in solitude, in pretty rooms, for hours a day. I've always had the sense that writing isn't supposed to be my main occupation, and that real life, overwhelming as it can be, is what gives me something worthwhile to say, now and then. 31 years ago today we got married. Of course we were impossibly young and naive, but we went into it believing that divorce was not an option. Ruth Bell Graham once said, "We never considered divorce. Murder, occasionally, but never divorce." So yes we've had tough times but thankfully neither of us changed our minds and here we are. I don't think you appreciate the gift of a strong faithful loving sacrificing man until you've been married for years and have seen the ditches littered with abandoned and neglected families. The hardest and best lesson I've learned: that only Jesus is Enough. And only Jesus can fill the deep-down hunger for security and affirmation and being treasured. Once you get that, then anything your husband does for you is icing on the cake. If you don't get that, then all your husband's efforts will fall short of being Enough, and you will feel a constant vague disappointment in the back rooms of your soul. To my complete surprise it touched a nerve and got a lot of Facebook-style response--likes and shares and comments. I told Ben about this. "I just don't get it. I can sweat for HOURS over a column and just get this lukewarm response, then I dash this out in five MINUTES and it goes bananas!" He said, "Yes, but it took you a lot longer than five minutes to learn the things you wrote about there." So hopefully in these overwhelming days I am learning something worthwhile as well. “It reminds me of the Dust Bowl of the ’30s,” my dad said, looking out the car window as I drove toward Harrisburg on one of this summer’s many hot, dry days. In a bare field to the west, a tractor and plow stirred up an expanding cloud of dust, as though the plow were dragging a brown tornado laid on its side. “How did you make it through those days?” I asked. 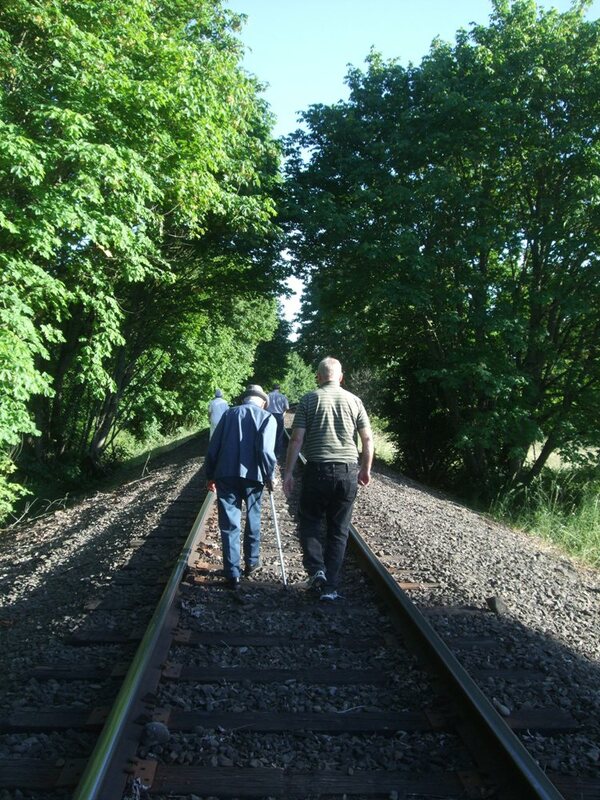 Dad, who is 98 years old, lives in Minnesota but is spending the summer with us. Oregon’s grass-seed harvest is fascinating to him. 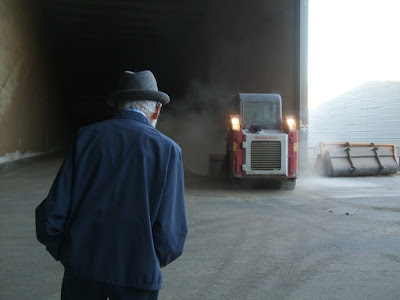 He stands outside in his blue jacket and gray trilby hat and watches the equipment at work in the fields — windrowers cutting and raking the grass, combines eating up the neatly piled rows and augering the seed into farm trucks, and then a convoy of tractors and balers roaring in and baling the loose straw left behind. “Farmer talk,” we call it, and there’s a lot of it at our house, even though we don’t farm any land ­ourselves. Dad talks about Oklahoma in the ’20s and ’30s — farming with horses and learning to survive when wheat brought only 25 cents a bushel. My husband cleans and processes grass seed and talks about germination tests and which lots of ryegrass are shipping out today and which farmer is finishing his fescue first. Her brother Ben and I look at each other. “Emily is talking farmer-talk?” he whispers, bending his eyebrows. “Yes. Bizarre.” I mouth back. After all, Emily is a college student who enjoys vintage fashion and writing computer code and discussing literature. She is also on her third summer of working for local farmers, so she can now discuss flail-chopping and fescue harvesting almost as easily as minimalism and multicultural communication. And it all makes me reminisce about farming in Minnesota in the 1970s with a John Deere 720, disking fields on spring days, picking rocks and stacking hay bales that even a high school girl like me could handle, but just barely. Farming is a diverse occupation, differing vastly in methods, equipment and crops from one part of the country to another and from one generation to the next. My dad talking about horses and sorghum is like a different language and culture from Emily’s harvesting ryegrass seed in Oregon on a John Deere ­combine. “I used to find horseshoes when I was land planing last year,” Emily told us. “They would get hung up on the blade and make this big groove in my nice smooth dirt, and I’d have to stop the tractor and go back and pull it off. “I guess a horse would throw a shoe and it would get plowed under and then gradually work its way back up again,” she guessed. “Maybe that field was a pasture for the horses at one time,” Emily concluded. Then we went silent for a little, thinking about horseshoes and land planes, what these flat brown fields have seen and how much farming has changed, from horses to sputtering narrow-nosed Farmall tractors to massive modern tractors guided by GPS. And yet, no matter the time or place, farming is about the same elemental things. Working the soil, dropping the seed, watching the weather. Fighting weeds, feeding stock, fixing equipment. Holding the head of grain in your hand, feeling its weight, deciding when to cut the first swath and then harvesting the loads of grain or seed or corn. And always, the miracle of life and growth and nourishment in that little dry kernel. It’s also about character, wisdom, thinking of the future, and the dangers of ambition over caring for the soil and for each other. “Do you think modern farmers are spoiled?” I asked my dad, referring to the physical work of driving a combine versus pitching wheat sheaves into a threshing machine. I thought of the increasing number of filbert orchards planted along Powerline Road. Apparently Willamette Valley grass-seed ­farmers are choosing to vary their crops as well. 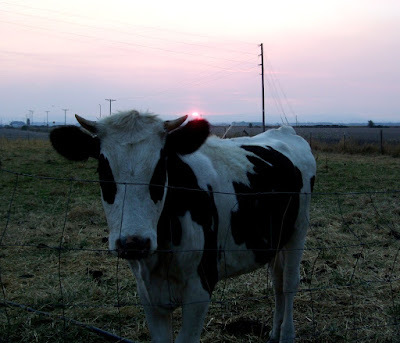 Local author Dan Armstrong researches agricultural logistics and encourages Oregon farmers to diversify, not only in case of a financial crisis but to encourage locally grown food sources in addition to seed crops. He works with small farmers seeking to grow food crops and market them in this area. He gave me a packet of quinoa seeds and told me how to grow them, a gesture that told me he is practical as well as theoretical. He and my dad would get along well. 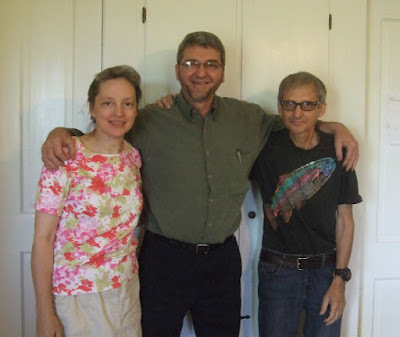 My husband’s extended family gathered in the front yard of Uncle James and Aunt Orpha’s house on a windy evening in July and ate grilled hamburgers and potato salad and cake. We didn’t when I was young, either. And yet, fundamentally, we did, and so did my dad, and so does the cousin with the latest New Holland combine the size of your house, and so did that farmer whose horse kept dropping his shoes for Emily to catch on the land-planer a hundred years later. Dirt sifted through carefully analyzing fingers, prayers for rain or sunshine, life and hope in a million tiny seeds, food on the dinner table — the soul-deep essence of farming always will be the same. Farmers always will speak farmer-talk, the summer sun will be hot on their shoulders, and the tiny green shoot pushing through the soil will forever seem a miracle.